So, as noted previously, I recently took a vacation. Now for those of you who are regular readers of this blog you know that I rarely take a vacation that doesn't also somehow involve a large mouse who answers to Mickey and the world built for him. Well, this time I didn't visit that World... I visit the Land that came first. In 1955 my favorite uncle, Walt Disney, built the first theme park all around the stories he grew up with as a child and focused on the cartoon character he had started drawing years before. When Disneyland (DL) opened it was out in the middle of the suburbs. Within 5 few years it was surrounded by motels and tourist traps and drawing in it's 20 millionth guest. In 2011 the park was smack dab in the middle of the city, and there were 16.11 million guests to see the mouse and his friends. In 2001 the latest expansion to the park was opened right across the way, where the parking lot once sat. The new park was called Disney's California Adventure Park. 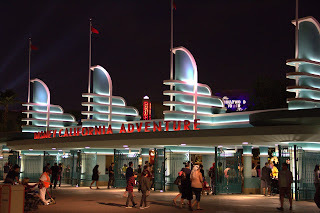 Nine years later, in 2010, it was changed to Disney California Adventure (DCA). The closest we could get to the sign with all the people. Two years later, in 2012, the largest expansion DCA had ever seen was opened... Cars Land. And I had 1.5 days to explore both parks. How ever would I get this done? Well, we (that would be Mrs. T and I) headed into DL and spent most of the day and night wandering around streaming video on the Internet (I am a member of EyesOnEars, remember?) for all the other fans to see as well. It was a great time and much fun was had. More on that another time though. The second day we decided to catch the rope drop (Disney speak for the opening) at DCA. Only problem is that they do things a little different there. We walked in the gate, all the way up to the central hub area, hung a right, and waited. There was a rope there. It was white. There was a security guard there to make sure we didn't step over the rope. Eventually there was about 80 people standing there with us; all looking at this rope and wondering how it is that one man and a rope can keep us all from further movement. 35 minutes later the rope was gone and we were waiting to board Mrs. T's favorite ride, Soarin' Over California. After that we wandered around and rode several other favorite rides over the next several hours. To be honest we really wanted to go check out the brand new Cars Land but the crowd was incredible so we were waiting for it to thin out a bit before we headed over there. Finally we decided it was time for a break. We bought a ice cold (no really, it was ICE cold) soft drink and take a seat on a bench not far from the entrance to Cars Land. As we sat there we relaxed and enjoyed the view. We watched all kinds of people wander by. The Asian family of 6 trying to read a map and figure out where they are going, the Caucasian family of 4 that were arguing about there to go next, the Hispanic family of 3 that are smiling and laughing. So many people so many different attitudes. TT and Sam, the best Cast Member ever! The next thing we know there is a Disney Cast Member (this is what they call the employees) stopping by and talking with us. Her name was Sam and she was from Lake Arrowhead, California. It turns out that Disney had restarted an old program called the Disney Ambassadors where Cast Members from the Guest Relations team are specially selected to represent Disney in the park. They handle issues on the spot instead of waiting until they come to the Guest Relations Center in the front of the park. The satchel she is carrying has instant access to their system and allows her to be in constant access with management. She also wears a radio for the same reason. After talking with her for a while we started to say our goodbyes and head on when she asked where we were headed. When we said we were going into Cars Land we heard the most amazing question: "Would you like a guided tour?" Hmmm, let me think about that for a minute. Of course we took her up on that offer. I did ask if she minded if I streamed the tour. She had no problem with that and actually Sam did a great job not only talking with the Mrs and I but also talking with the viewers on EyesOnEars as well. Wonder if there is room in the inn? As we wandered into the newest of the park she began to tell us all kinds of information about this area. First off? This is the only area in the park without portable carts for all kinds of goods sitting along the pathway. All the retail areas were incorporated into the locations such as the Cozy Cone Motel where you could get refreshments, or Sarge's where you could buy various souvenirs. All this was just another example of the attention to detail that Disney commits to everything they do. As we were walking down the street we were asked to step aside because Lightning McQueen was headed to the Cozy Cone and needed room to get through. Yes, I said Lightning McQueen. As you can see from the picture he is actually moving on his own and we actually encountered several times as we walked around the area. I don't know how they do it, and I didn't ask, but there were no handlers carrying controllers, and Lightning was actually talking to people as he drove out and back. The other purpose for the Cozy Cone was the Meet and Greet location for the Cars characters and as you can see there were more than just Lightning McQueen showing up for pictures. Tow Mater also made an appearance at the Cozy Cone. Sam mentioned that the vehicles moving to and from the Cozy Cone was something new to her as well and she had never seen this before. How fun! All the stores and locations you see in the movie including Luigi's Casa Della Tires. Luigi's has an attraction called Luigi's Flying Tires. The legend is that in Luigi's homeland they have a holiday every year that celebrates a day that tires actually will fly. On this ride you will get onto tractor tire size ride cars and play bumper cars with others who are also on the ride. If you look closely you can also see that there are beach balls in there as well. the story behind this is that the Imagineers (the geniuses that design and build everything Disney) had originally had installed joysticks on the tires to control the direction of the tires movement, but there were issues with this approach so they removed them and made it so that the riders leaned the car to make it go in any direction. When they had the Cast member preview they discovered that people didn't naturally know that you leaned to drive the tire. Once again, Imagineers to the rescue. They threw some large beach balls into the ring and encouraged the riders to reach for them. As they watched the test continue they found that the beach balls actually made the ride even more enjoyable. So they left them in and everyone rejoiced! We walked back to the main street and saw even more buildings from the movie. Walking down to the end we walked right up to the Fire Station and there was the statue of Stanley just like in the movie. Sam took a few minutes to tell us about the area, including the incredible details that were in the whole of Cars land. For instance the flowers we were standing next to were made up from tail lights and the planters are tires. Once again, attention to detail. And now for the best moment of all. As we are talking with Sam and learning a great deal about this amazing area she looks at me and calmly asks, "Have you seen the Hidden Mickey yet?" I looked around and couldn't see anything. Nothing, not a thing. Mrs. T looks around and sees nothing as well. Sam smiles and calmly says, "Look above you." And there it was. A Hidden Mickey. Those Imagineers are some sneaky people. Will I tell you where? No. But I will give you a picture and you can see it for yourself. As it turns out the video is still available and you can view all what I have told you about and a lot that I didn't. Thank you very much for one of the greatest moments in all my Disney visits. You are awesome. I hope you have a long a prosperous career with Disney and all your dreams come true.